Hemel Town boss Dean Brennan was full of praise for youngster Harry Hickford after another fine display from the MK Dons loanee at the weekend. The 19-year-old midfielder was forced to move to centre-back in the early stages of Saturday’s win over Truro following an injury to Oliver Thorne. 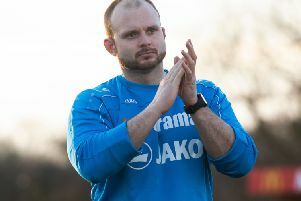 He went on to deliver an excellent performance, and Brennan says he is thrilled with the development that Hickford has made during his time at Vauxhall Road. “I thought Harry Hickford did really well for us,” said. “For a young player he adapted really well and I was delighted with his performance. Brennan is now looking for Hickford to kick-on and continue his progression with the Tudors. He said: “We didn’t win the first couple of games when Harry came in so it was tough for him, but I think he will develop into a fantastic centre-midfielder.